A fire which ripped through a Grade II listed building appears to have started by accident, Lancashire Fire Service says. Alston Hall at Alston was ripped apart by a blaze on Wednesday, March 15 and fire service investigators have now ruled out arson. An extensive two-month enquiry into the cause of the huge fire came to head late last week with a definite conclusion expected later this week. More than 70 firefighters tackled the blaze, which broke out at the three-storey mansion. Crews and 10 fire engines fought the fire using water from a nearby pond. The gothic-style mansion was in the middle of being renovated by its private owners when it caught fire. An estimated 60 to 70 per cent of the roof on the structure, which dates back to 1874, was destroyed. Alston Hall was built between 1874 and 1876 for colliery owner John Mercer and remained a family home until 1949 when the hall was sold to Preston Borough Council. 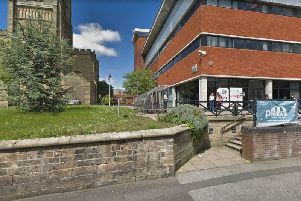 In 1974 it was bought by Lancashire County Council and used as a further education college for day, evening and residential classes before closing in December 2015 and being put on the market. It’s known the purchaser paid in excess of £1.5m for the hall, which included 35 en suite bedrooms, conference rooms, bar restaurant, a commercial kitchen, chapel and conservatory. The 9.6 acre site, with mature gardens and woodland, also had two separate outbuildings with classrooms and bedrooms. Ribble Valley Borough Council recently passed plans for the change of use of the former college to a residential dwelling, lodged by architects Cassidy and Ashton, on behalf of a Mr I Patel.